There are probably times where your body will feel slow, rundown and sluggish. If that’s the case, you either need to get more sleep, or you need to detox. Detoxing will help clean out your insides and remove toxins and excess fluids that have invaded your body and stolen your energy. And not only that, it could also benefit your hair, skin and nails and help you sleep better. There are plenty of ways to detox (check out our guide to juice cleansing! ), but the one that might just be the simplest is detoxing with herbs. Incorporating different plants and roots into your diet can help flush out certain organs so that they function at their highest potential. And there are also many health benefits to consuming these herbs, so it’s pretty much a win-win situation if you choose to cleanse this way. Herbs are nature’s beautiful and beneficial gift to us. They’re great additions to gardens for colorful accents and scents, but they also provide a stellar performance in the kitchen–they add tons of flavor when incorporated into recipes (check out this one for Creamy Lemon Herb Dressing!) and they also make for great natural remedies to help alleviate physical discomforts like headaches. But when used for detoxing, however, different herbs have different cleansing benefits, so it’s important to learn about what the ones you are using will do for your body. Herbs such as turmeric and ginger, when paired together, are powerhouses when it comes to improving your digestive system. Ginger calms queazy stomachs while soothing digestion, and throwing turmeric into the mix will help cleanse your liver at the same time, as that organ is an integral part of digestion because it produces the bile that helps break down fats. Turmeric on its own also helps regulate metabolism and lessen mucus buildup that comes from eating heavy foods. Fenugreek, an annual plant, will help to thin bile so that the liver is not backed up with toxins. In its herbal form, it will also alleviate diabetic symptoms. Don’t get out your weedwacker just yet! Dandelion is beneficial for the liver as well because it promotes bile production. It also has laxative qualities, but it should be issued to you by a doctor because it is known for triggering some allergic reactions. Cilantro, one of the most popular herbs used for seasoning, helps remove toxic metals that accumulate in organ tissues. Ginkgo biloba improves blood flow to the scalp and promotes healthy cerebral function–this may help detox your hair. Milk thistle is another great digestive aid, as it produces bile. The list is endless! Herbs provide all sorts of detoxifying benefits, and the best way to see which ones work best for you is by trying them out yourself. For detoxification purposes, it’s best to consume these herbs in higher concentrated amounts, either in teas or supplement forms, rather than sprinkling some into a recipe. But that doesn’t mean you shouldn’t! Consuming these herbs in any way is better than not at all, so do what is more convenient for you. Most herbs make for delicious, soothing teas, so try drinking at least one cup of herbal tea per day (we recommend when you’re curled up on the couch after a long day at work). If home cooking or settling down for a cup of tea just aren’t feasible for your daily schedule, then try the following veg-friendly herbal supplements for an easy way to incorporate some of these cleansing powerhouses into your diet! Just don’t take them all at once, as too much of a good thing can reverse their positive side effects. 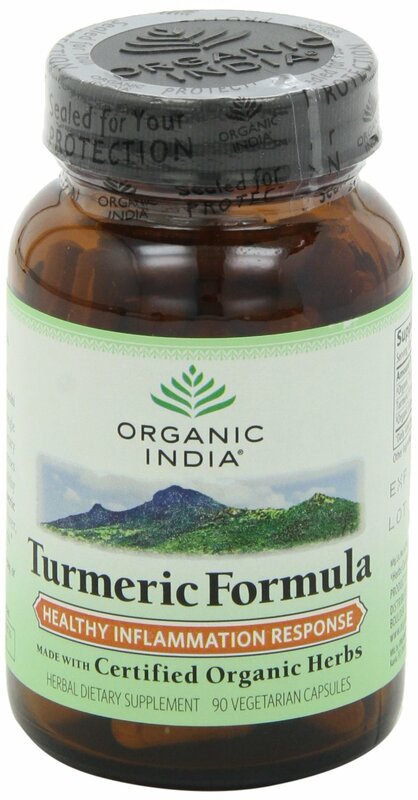 Organic India promises that its turmeric capsules, which help aid digestion and support metabolism, will also clear up skin.